Executing the computation produces an output raster with the same extent as the input raster and a typical coding scheme of 0 for not visible, and 1>=n>=m for a count of the frequency with which the cell in question may be observed from the m source points. 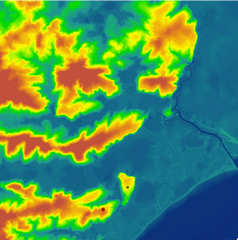 Mapping this raster for values that equal m will identify those parts of the landscape visible from all observation points (in Manifold this is a separate selectable option). 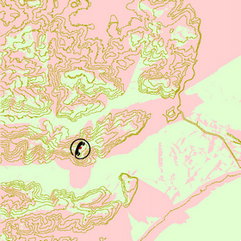 Several GIS packages use the term Radiate rather than Viewshed for this type of analysis. 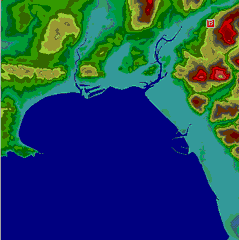 Because of the sensitivity of viewshed computations (algorithmic and surface detail uncertainties) some packages and algorithms provide a level of uncertainty built into the procedure, for example dividing the regions into: (i) almost certainly visible; (ii) possibly visible; (iii) possibly invisible; and (iv) almost certainly invisible. As an example we shall consider the case of preliminary selection of sites for mobile radio masts. The first step is to obtain a DEM for the study region, with the finest resolution available. In this case GB Ordnance Survey 10m DEMs were used. The second step is to identify potential locations for masts based on areas that are known to be poorly serviced or not serviced at all. The mast height is an important factor, as may be issues of access, land ownership, power availability, security, proximity to schools and houses etc. All of these are readily accounted for within GIS packages. Figure 6‑19 illustrates this process for a sample region covering 10kmx10km in Southern England (the lower left corner is the TQ81NE tile we have used elsewhere). Figure 6‑19A shows the topography of the region, with the dark blue area in the lower right corner being the sea. 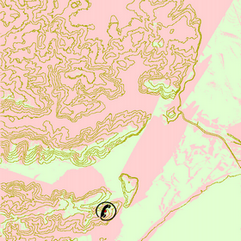 Figure 6‑19B and Figure 6‑19C show two different viewshed rasters, based on 10m high masts located where indicated, with the pink areas being non-visible locations and green areas as visible. The different “shadows” cast by local topographic features are clearly illustrated. This analysis is simplistic for radio transmission analysis since it does not take into account the characteristics of radio wave propagation. Visibility may not be sufficient to determine signal quality. Other factors to be considered include: the frequency of the transmitter; the power of the transmitter (or gain); and the terrain surface in the neighborhood of the transmission path, all of which affect the strength of the signal at the receiving site (the signal loss or attenuation). For example, trees and buildings that rise above the land surface but are not in the direct line of sight may produce signal attenuation and a zone of clearance around/above such obstacles is required in order to obtain a satisfactory received signal. Special purpose software packages exist for performing such computations, many including mapping and profile analysis facilities, and a number using GIS format files (e.g. .SHP, USGS DEM) for input and optionally output. 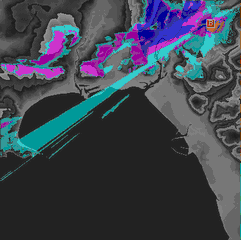 Examples of such software include ATDI’s ICS Telecom and Softwright’s Terrain Analysis Package (TAP). 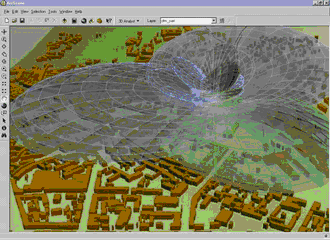 Software built upon GIS platforms includes programs such as Cellular Expert which runs as an ArcGIS application (Figure 6‑20, ArcScene visualization). Figure 6‑21 illustrates this process using the (now superseded) HerTZ Mapper software for a sample DEM in South Wales. A test site for a mast has been placed at the location marked B. This was specified as an 8m high mast, with transmission frequency 1800MHz and 34dB gain (typical of GSM mobile phone masts designed for small cell operations). Figure 6‑21B shows the predicted signal strength based on a Bullington-Fresnel propagation model, with colors indicating the difference signal strengths. As noted earlier, these kinds of computations can be developed as programmed extensions to mainstream GIS packages, such as ArcGIS. In addition to software providers and consultancies, a number of telecommunications operators and service providers have adopted this approach and produced their own internal systems built on GIS platforms (e.g. the US operator, Teligent, again using ArcGIS software). A significant advantage of this approach is that a vast range of fundamental and associated data are available and managed within GIS frameworks, enabling pure engineering modeling to be combined with customer and service area analysis, facilities management, and environmental and planning considerations.